Description: While the NS was assimilating Conrail, it ran some trains between some unusual city pairs. 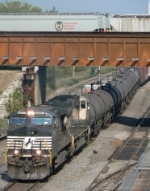 One of them was a train that ran beteen Binghamton and Bellevue OH, seen here passing the Erie station in Owego. 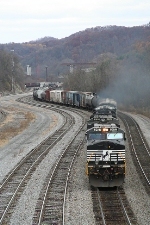 Description: A eastbound intermodal growls through Highland cut. Description: Two Dash 9s in Elephant style lead 24V past the VFW in Macungie. Description: An NS northbound intermodal enters the siding at Pinson interlocking as the rain pours. The northbound signal indicates red over red over yellow (restricted) which tells me the dispatcher has 'fleeted' the signal for an additional northbound. 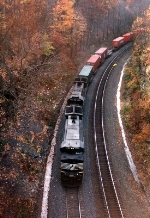 Description: A northbound intermodal has a clear signal through the siding. The skys open up just as it arrives and unfortunantly my car is on the OTHER side of the tracks! Description: WB autorack, 13th Avenue crossing, 0810 hours. Description: A catfish thunders below a CP grain train while heading East. Description: EB NS train 111. Description: 252 flys across Shook Road. Description: NS 19G is dropping off four cars of cocoa beans that will soon be turned into delicious Hershey's chocolate. Description: A regular in these parts, NS 285, eases thru Dalton around it's normal time. Description: An NS eastbound grain train charges through Vickers Junction with a UP unit trailing. Description: NS 9471 leads an eastbound under the signal bridge for Vicker's Junction.